Shirts With Random Triangles: Arizona state gives head coach Rich Rodriguez a two-year contract extension. Arizona state gives head coach Rich Rodriguez a two-year contract extension. 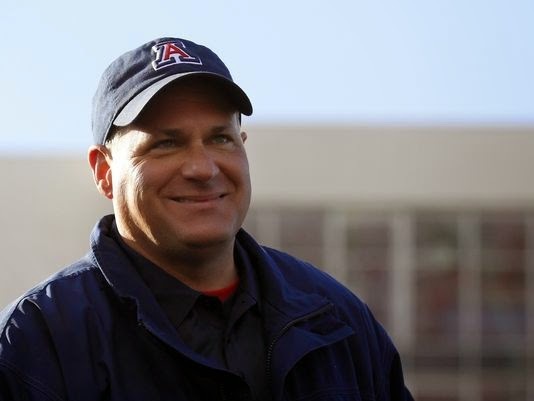 Rich Rodriguez. Photo via azcentral.com. It looks as though Tucson will have Rich Rodriguez to kick around until 2019. The University of Arizona and the Wildcats head coach have come to an agreement on a contact extension that will go through the 2019 season. This is pending approval by the Arizona Board of Regents. Arizona and RichRod came to terms to a two-year extension agreement that raises his base salary to $1.9 million. That is on top of $500,000 that he receives for what are described as "peripheral duties" such as TV and radio appearances, and additional incentives, which include $1 million should he win a National title as the Wildcats' head coach. Rodriguez has gone 16-10 in his two season at Arizona, including wins in the 2012 New Mexico Bowl against Nevada, and the 2013 AdvoCare V100 Bowl against Boston College.